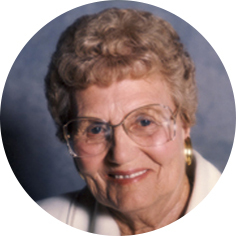 Irene Okerstrom passed away peacefully at the Moose Jaw Extendicare on October 7th, 2016 at the age of 102. Irene was born May 22, 1914 to Victor and Ethel Eldstrom, at her uncle’s farm west of Moose Jaw. She was predeceased by her loving husband Olaf, her son Robert, her brothers Lloyd, Elwood and Vern as well as her sister Phoebe who died in infancy. Irene will be lovingly remembered by her family: son Garry (Huguette) and their son Daniel; son Donald; daughter in law Corliss and children: Shawn and daughter Summer, Sheldon (Joanne) and children Emily and Owen, Ryan (Joanne) and their children Camille, Gavin and Eric. In the early thirties the Eldstroms moved to Shellbrook, sometime later Irene came back to Moose Jaw to care for her ailing Grandmother. It was at this time that Irene met and fell in love with Olaf. She married Olaf on October 19th, 1938 and together they farmed 8 miles south of Moose Jaw, in the Archive district. Irene never shied away from hardwork and would be at Ole’s side helping with the farm work, all the while caring for their young 3 boys. She took pride in her home and yard and loved to garden. Amongst her many interests, Irene loved to sew, making a great many outfits for herself and her family. She enjoyed reading, and quilting with the Four Corners Friendship Club. Irene also loved to square dance and round dance, continuing this hobby well into her eighties. She took great interest in her children, grand-children and great –grandchildren.